Soft and fluffy crescent rolls brimming with the cozy flavor combination of sweet potato and nutmeg, and smothered with honey butter. In a small saucepan set over medium low heat, warm the butter, honey and milk until butter is melted and mixture begins to steam. Do not boil. Remove from heat and let sit 5 minutes, or until the temperature is between 120-130°F. In the bowl of a stand mixer fitted with a dough hook, combine 1½ cups of the flour with the yeast, salt and nutmeg. Add the milk mixture and mix until combined. Add the eggs one at a time, mixing after each, followed by the sweet potato puree. With the mixer on low, add the remaining flour ¼ cup at a time until dough clears the side of the bowl but is still slightly sticky to the touch. You may not need all 4 cups of flour. Gently punch down dough and knead a few times. Cover it with the plastic wrap and let it rest for 15 minutes. On a clean surface roll the dough out into a 16-inch circle. Using a pizza slicer, cut the dough into 12 equal pieces. Working with each piece individually, roll the dough up starting with the fat end. Place the roll on a sheet pan lined with parchment paper so the skinny point is on the bottom. Cover with plastic wrap and rise again for 30 minutes. While the rolls are rising, preheat the oven to 375°F. Bake rolls until they are golden brown, about 20 minutes. While rolls are baking, prepare the honey butter. In a stand mixer fitted with a paddle attachment or in a bowl with a hand-held mixer, beat the butter, honey and salt until smooth. 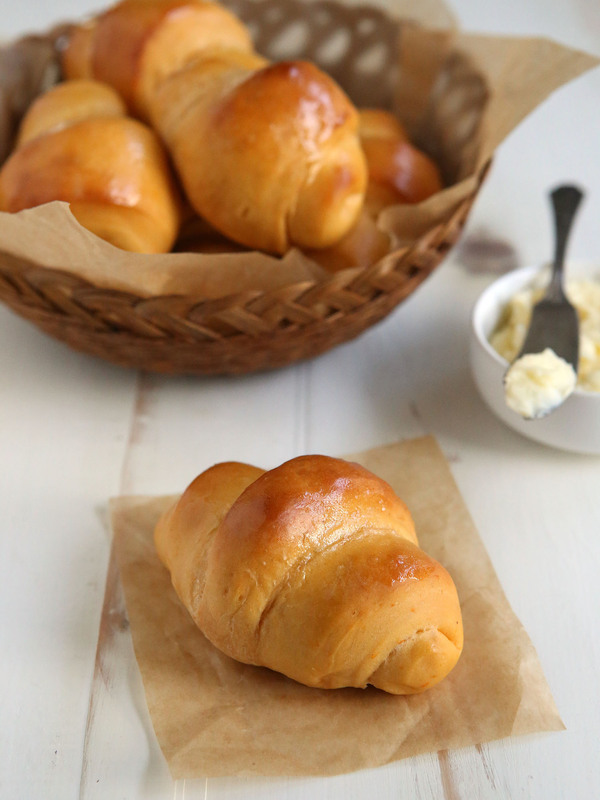 Brush hot rolls with some of the honey butter, then serve with additional honey butter. The rolls are best the day they are made but will keep in an airtight container at room temperature for up to 3 days. To make sweet potato puree: prick sweet potato(es) with fork and place on a sheet pan. Bake at 350°F until soft, about 1 hour. Let cool to room temperature, then peel and mash with a fork.